When you catch up with a friend and go for a coffee, and your friend mentions- 'Hey, let's try something new' chances are you'll pull out your phone, click on the Zomato app and see what's trending in the area and what places have great reviews written about them. It's the modern way people find out what is good, and what isn't so good. According to research 88 per cent of consumers trust online reviews as much as personal recommendations. As agents, you should know and embrace the power of how reviews can transform your business and drive you to be a more noticeable expert agent in your local area. For consumers running a standard search on your name, if you do have a lot of reviews written about your service, it will increase your SEO and showcase you as an expert agent for people wanting to find more. 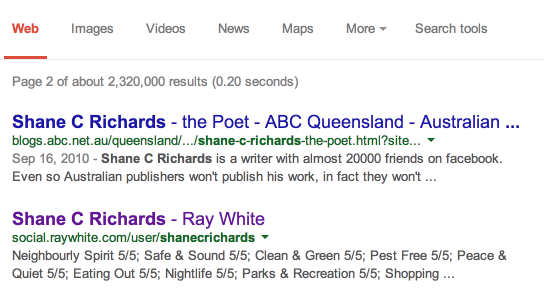 Local Ray White Agent Shane Richards is appearing at the top of page 2 on Google due to his ratings and reviews. 1. Be direct, tactical and sincere in asking for reviews. Asking for reviews should be worked in to your engagement with all consumers. It should only be done after you have built up trust, but after working with a buyer or seller, telling them in person you will be sending over a link for them to review you and then follow up, is the best way to get consumers engaging with your personal brand. 2. Provide something that will entice your consumer to give you a review. As an agent, consumers will take your words as expertise. In order to build trust, make your consumer feel like they have earned something that they want to repay you with a review. If you provide good content they will be inclined to help. Market Updates, Survey results, and past endorsements from other consumers are all reasons they will review you. 3. Use reviews to drive your market. If you're looking at selling more off the plan, ensure that every engagement you have with a consumer in that arena results in a review. If they can somehow tie back the advice you gave to being specific to that market, you will become an expert in that area. 4. Work backwards and use this for re-engagement and lead generation. You don't need to just start with clients you are currently working with. If you have done well by clients years ago but lost contact, start by calling them, update them on the market, find out where they are and how they are doing and then build rapport. After some time (and not too early) you can ask them to rate your engagement and explain how it will help. Say you have five listings going at once. In those five listings you see thirty people for each property. Start with one property and go through that inspection list and stay engaged with them, after spending a week on finding out their wants and needs, ask them to review you. Not all of them will, but once you have gone through this then move on to your next listing and do the same. Don't ask everyone at the same time as you won't be able to track them and it will look staged. 6. 3 and 4 star reviews are just as valuable as 5 star reviews. Agents get concerned that if they don't get a 5 star rating asking for reviews isn't worth it. The best way to build up validity is to have reviews that aren't perfect but show your skills. A three star review that says you were a good agent, but couldn't find the right home for a person at that time is a better review than none at all. Remember that reviews are your validation to clients, people will prefer buying from someone who has had 100 reviews that ranks you at 80 per cent more so than an agent that has had one review but it is at 100 per cent - A larger quantity of reviews does ensure validity and is the best way to speed up your expertise and lead generation in any given area. Homely is a new way to search for Hawthorn real estate for sale, and properties to rent in Melbourne. With over 340K listings and 500K local reviews and insights, Homely is a faster and easier way to search for property to buy and rent in Australia.